We know from opinion polls that Americans basically agree with the liberal agenda. But on election day, they vote for conservatives. So what gives? 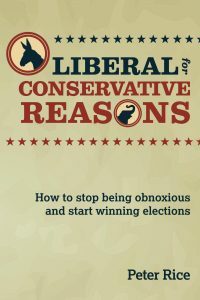 Journalist Peter Rice argues that liberals cheat themselves out of victories by being annoying. They’re all-too-quick to judge opponents as stupid, racist, insufficiently compassionate toward polar bears, and otherwise morally inferior. And they throw dry statistics and appeals to empathy at voters who are in no mood for either. In short, they sell liberal ideas with liberal values, which is about as effective as the guy at the dealership selling you a pickup by telling you about the fat commission he’s got coming. Luckily, there’s a simple solution: Use arguments that actually resonate with the other side. Be liberal, but for conservative reasons.